Next Post → Cluetrain Plus 10 Project Needs You! I would be interested in helping out with this project.. especially with my Gen Y perspective. I love the Cluetrain and refer to it at work, and look at chapters on my bookshelf at work. OK Duane. I’ve got you down for a post. More details coming soon. Keith, I’ll join you. 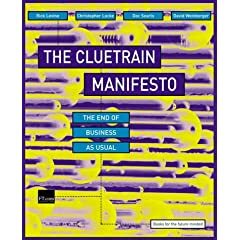 Cluetrain was an important piece when it came out and deserves the retrospective. I thought I would register for one of the Cluetrain theses. I read it in university and would gladly pick it up again. Hi Keith – I’ve signed up on the wiki (thesis #15), but though I’m a marketer I’d prefer to put the entry on my broader general-interest blog (which gets more traffic anyway). Hope that’s OK! Keith, would be pleased to help out. A number of years ago, David and the lads granted me permission to use this wonderful body of work formally so I could include it in my courses and lectures.